Why Do You Need New Replacement Windows for Your Home or Office? Is it time to replace the windows on your Brampton home, but you aren’t sure where to start? Or maybe you do know where to start, but the whole project just seems too stressful, so you keep putting it off. 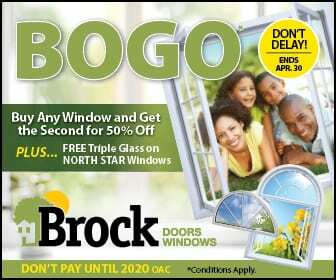 The experts at Brock Doors and Windows understand! Window replacement requires a lot of different decisions and choices. For many homeowners, it can be a stressful process, but it certainly doesn’t have to be. Our six handy window replacement tips will help you to enjoy a stress-free experience with your Brampton, ON windows replacement project. What’s more, you may even find it fun! Remember-the more research you do ahead of time, the fewer problems and regrets you will have later. Window replacement is a big investment, so choose your replacement windows and contractor carefully. Start by getting references from friends and family or reading reviews from past customers. Then, make a list of the window features that are important to you. Remember the old saying: if it seems too good to be true, it probably is. This goes for price, especially, and over-the-top promises from contractors. Take the time to ask any questions. Professional contractors should always welcome your questions, not avoid them. Energy efficiency. Window replacement is a major investment in your home, and therefore it should also be a long-term investment. Be sure you take this into account when choosing your windows’ performance features. There are some pretty great features out there. Some of these are tilt-in windows for easy cleaning, or vinyl windows with “wood-grain” technology that creates the look and feel of wood without the maintenance. It’s wise to always depend on reputable sources for your information. Government websites like Energystar.gov is one excellent source for facts and information about window replacement and energy efficiency. Trusted professionals like Brock Doors and Windows are also a great place to turn for advice and information. We are more than happy to educate you on whatever you want to know. Tip #5 Get ready for your windows’ big day. There are some easy things you can do on installation day to ensure that your windows are installed as smoothly as possible. If you have young children, it may be a good idea to take them out for the day. Clean up around your windows. Make sure any furniture or window furnishings are cleared away from the area where the windows will be installed. If you have pets, kennel them. Not only is this considerate to the installation team, but you won’t worry that your pets will be a distraction, or get harmed in the process. Contrary to what many homeowners think contractors are not just for installation. There are many benefits to getting a professional’s touch on all steps of your project. Not only will you ensure that the job is done right the first time, but you’ll get the advantage of an expert opinion from start to finish. Don’t feel like you have to do your project all by yourself. The professionals at Brock Doors and Windows are here to make your life easier! Give us a call today to schedule your free consultation!